Those who communicate messages are always in search of attractive ways to carry their information more effectively. IRISTEXT answers that need for internal communication and information in public areas. IRISTEXT is used to rapidly reach the greatest number of people. It broadcasts information through a network of video monitors or television sets installed in the most frequented areas. IRISTEXT is ideal for information that needs continuous updating. IRISTEXT's integrated design allows non-technical personnel to quickly create and update attractive messages combining text on pre-composed resident backgrounds and graphic illustrations. All composition happens in real time with easy-to-use editing features. Data is stored in nonvolatile memory for unequaled reliability and fast retrieval. With the broadcast-scheduling feature, information can be programmed to appear just at the right time. Events can be scheduled by date, hour, minute and second to control a message presentation. IRISTEXT Video Billboards are dedicated reliable 24x7 equipment designed specially to accomplish a very specific task: the editing and broadcasting of information. IRISTEXT can control an unlimited number of other IRISTEXT Video Billboards via Internet or by local network. 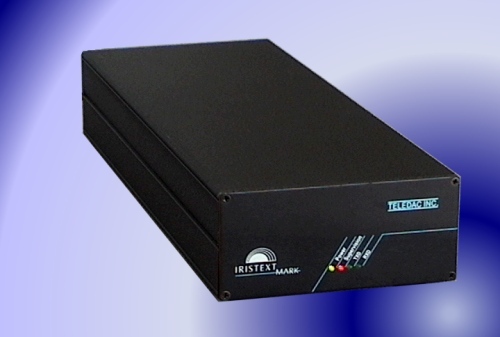 IRISTEXT's Mark line includes 4 models designed with 24x7 technology. The Mark IV and Mark V require a Personal Computer for editing while the Mark II is completely stand-alone. The Mark III is a broadcast only unit. It can display messages created on another Iristext unit or a PC using I-Reach software. All models also include a clock/calendar, an express message crawl and unlimited telephone support for 60 days. continuously on 1 line of the screen. Built-in every Mk models, a crawl banner can include up to 5000 characters of text message (See <<< Express Message Line>>> on above screen). All attributes such as on screen position, crawl speed, background colour and width, font size, or text colour can be defined. When needed, the crawl can be activated to display continuously, or under display scheduling: at once during only one page or for the duration of many pages. Both models are used for broadcasting messages created on PC using I-Reach software running under Windows. The user can prepare, in advance, all his messages and schedule in a PC file. Everything is then transferred in the Mark unit through the PC serial or USB port**. Once the transfer is completed, the PC can be turned off, and the Mark unit will broadcast and update contents according to schedule. The unit can be sited locally or remotely. border, shadow, italic and bold. 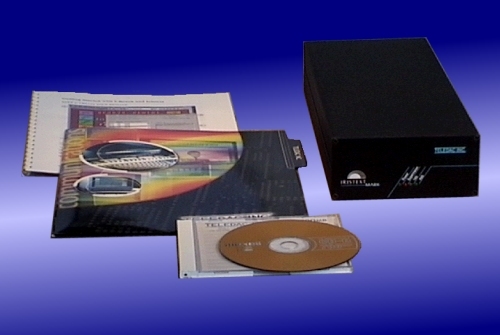 The I-Mk-V model includes all above I-MkIV features plus an overlay card to insert text messages, graphic elements or a crawl banner (Express Message) over an incoming video (Composite or S-video). The crawl banner can be transparent, semi-transparent or opaque. 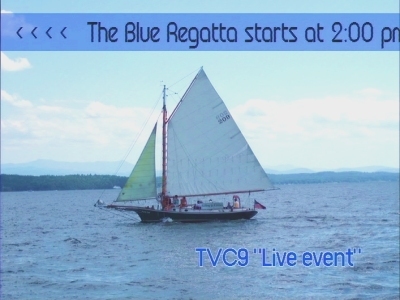 One channel remote broadcast video billboard, same as IRISTEXT MkII but without editing functions and without keyboard. Broadcasted information has to come from an I-MkII, I-4000-Se, We, S2, or a personal computer using I-Reach software. 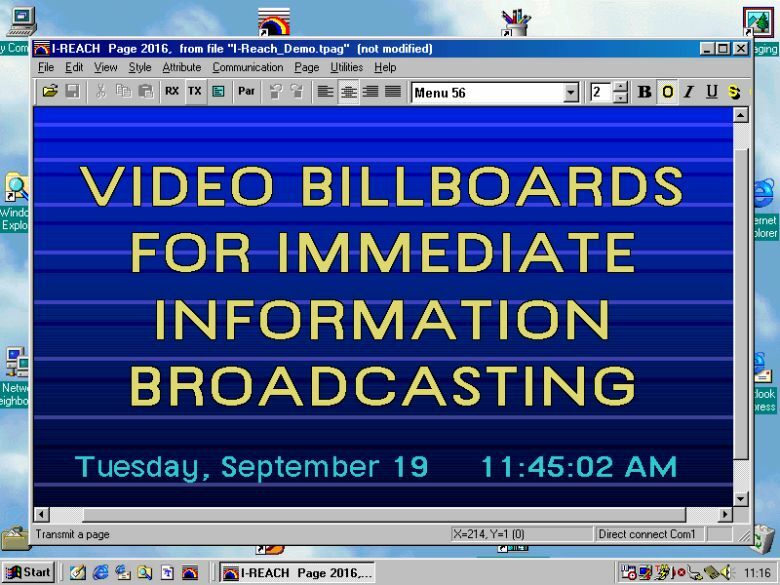 With I-Reach and Remote Desktop (RDT), one or more persons can easily be appointed for entering and updating each type of information to be broadcasted. Remote Desktop (RDT) is a Windows application program. 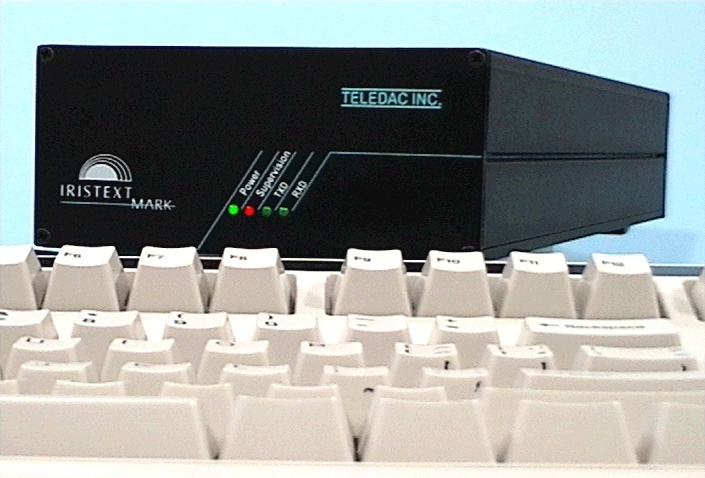 Using RDT, each information provider can control the I-Reach computer remotely via the internet (or local network), as if he was sitting right in front of it. Required video monitor not included.